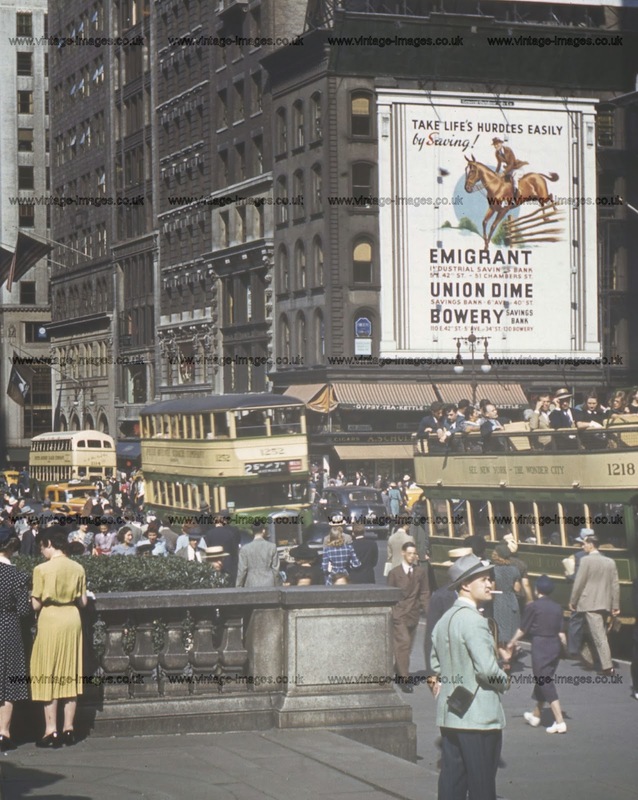 The Past in Colour: New York - The Wonder City! New York - The Wonder City! New York on the verge of World War 2. 5th Avenue positively heaves with traffic in this view from 1940. Taken from the steps of the New York Public Library, the third largest public library in the World behind the Library of Congress and largest, the British Library. The bus in the foreground from the Fifth Avenue Coach Company extolls visitors to "See New York - The Wonder City". Three of the companies' vehicles are in view with the next vehicle (possibly a 1931 model, as the company built their own coaches as well as running the routes) on route 2 from Washington Heights to Madison Square. The company went through various sales of parts of the business from 1954 and following a labour and financial troubles the company itself was absorbed into the cities transport system in 1962. The three banks mentioned on the poster, The Union Dime, the Emigrant Industrial and the Bowery savings banks had various chequered historys. The Union Dime being taken over in the late 1970s, the Bowery is now part of Capital One and the Emigrant Industrial is now the pargest privately owned bank in the USA. If you look closely at the building in the middle of the picture you can see a branch of the Gypsy Tea Kettle resturant chain (air-cooled, definitely required in the heat of a New York summer), where you could get your fortune told. This branch opened in 1931. After you had drunk your tea the tea leaves would be read. The chain finally closed around the turn of the millenium. New York in the Summer of 1940. With just over a year to go before World War 2 this would be the penultimate summer of peace.